But even if they manage to survive the storm, these teetering structures are still doomed. It’s only a matter of time. 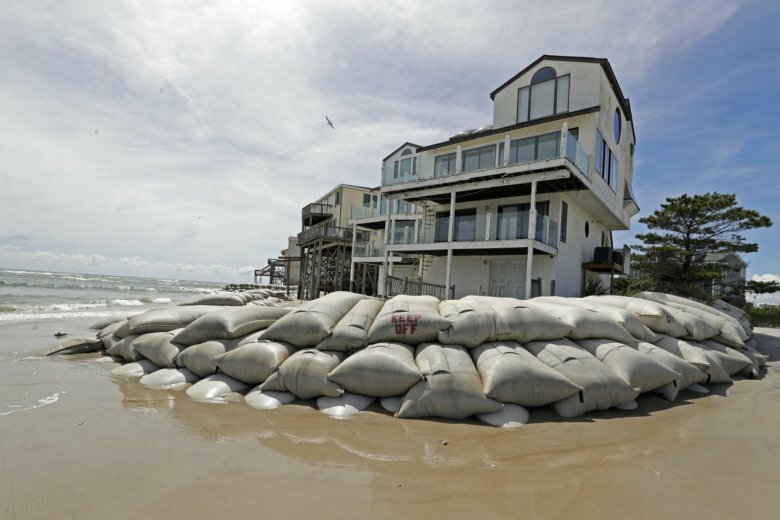 The low-lying barrier islands hugging the Carolinas coast are experiencing some of the fastest rates of sea level rise in the world, nearly an inch a year. Worried that such dire warnings were bad for business, coastal developers successfully lobbied North Carolina’s Republican-controlled legislature to pass a law in 2012 requiring state scientists and regulators to consider the “full range” of other possible hypotheses, including those pushed by climate-change skeptics who claim sea levels might remain flat, or even fall. The law requires officials to look at the “spectrum of data out there, not just the data that suggest the sea level might rise” then-GOP state Sen. David Rouzer, a primary sponsor of the law, declared at the time. He is now a member of Congress. Michael Mann, a climate scientist at Pennsylvania State University, said the politicians behind the North Carolina law are placing their constituents in harm’s way. Across the state line, South Carolina’s coastal development boom also appears little deterred by rising seas. Huge apartment and condo buildings have sprung up in recent years in some of the state’s lowest-lying areas. While a few inches of sea level rise per decade might not sound dramatic, higher seas mean higher storm surges. When Hurricane Sandy hit in 2012, a study found sea-level rise over the 20th century caused more than $2 billion in additional damage in New York City due to the “extra” storm surge it generated. Strained by last year’s historic flooding in Texas following Hurricane Harvey, the federal flood insurance program is currently more than $20.5 billion underwater. Congress cancelled another $16 billion in debt owed to the federal treasury. She said the property, which stands atop stilts, is fully insured through the federal flood insurance program, though the couple hadn’t yet considered whether they will rebuild if Florence, or some future storm, wipes it away.